No lengthy disquisition this time, just notes on two recent New York happenings, the Wine Media Guild Taurasi luncheon and Ed McCarthy’s unveiling of his five favorite Italian white wines to the Gang of Six. The WMG event was the regular May meeting, upstairs at Felidia Ristorante, with the usual rugby scrum to taste all the wines and take notes before lunch (actually better, now that there’s room for an additional tasting table). 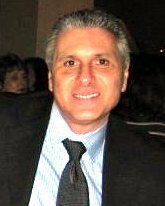 The guest speaker and principal organizer of the event was Maurizio De Rosa, a Naples-born one-time NY restaurateur now back in Italy and working for Feudi di San Gregorio. Feudi has quickly grown to be the largest (and best capitalized?) winery in Campania, and Maurizio is one of the most knowledgeable people around on the wines of his native region. His focus was Taurasi, Campania’s red DOCG wine, and he managed to round up for the occasion 19 examples of Taurasi from 19 different producers – no mean feat, since several are very small and in quite limited supply. They were Boccella, Caggiano, Cantina Crogliano, Cantina dei Monaci, D’Antiche Terre, Di Meo, Di Prisco, Feudi di San Gregorio, La Molara, Lonardo, Mastroberardino, Molettieri, Perillo, Romano Clelia, Terradora di Paolo, Urciolo, Villa Matilde, Villa Raiano, and Vinosia. All were interesting, though many marred their fine Aglianico fruit (Taurasi is usually 100% Aglianico, though a small percentage of Piedirosso is permitted) with too much new oak – the bane of every expanding wine region all around the world. For me, the outstanding wines were the more familiar ones: Mastroberardino, Terradora (the other half of the Mastroberardino clan, after a horrendous family break-up in the mid-90s), Feudi, Di Meo. The Villa Matilde, which I’m normally very fond of, showed a bit tight and unready, perhaps going into eclipse (it was vintage 2004). The 2004 from D’Antiche Terre was also fine, but its price is about twice that of the other wines shown: perhaps a Gaja del Sud in the making here. Just as interesting as the wines were Maurizio’s remarks. According to current research, Aglianico doesn’t derive from the word for Hellenic, i.e., Greek, as has long been thought, and the grape wasn’t introduced to Campania by the early Greek colonists of the region. It seems in fact to be an Italian native, probably established in the Naples area by the Etruscans, who had pushed that far south centuries before the Greeks arrived. That may make Aglianico the longest-cultivated variety on record. Maurizio also explained that the Aglianico growing area, traditionally centered on the town of Taurasi in the province of Avellino (which name may, in passing through the mouths of the successive French and Spanish masters of the Kingdom of Naples, have metamorphosed into Aglianico) is really divisible into at least four distinctive zones, which differ by soil type, elevation, and the character of the Aglianico they produce. All this information and more will be contained in the book about Taurasi that he is working on. By the way, should you meet Maurizio, never refer to Taurasi as “the Barolo of the south.” Barolo, he insists, is the Taurasi of the north. The Gang of Six is, first of all, a collection of pizza freaks, whose devotion to real Neapolitan pizza has led them to gather as frequently as they can at Keste or Pizza Fresca for massive intake of carbohydrates and as much fine wine as the members can manage to bring with them. This time, exceptionally, we convened at Donnatella Arpaia’s Mia Dona – no pizza! 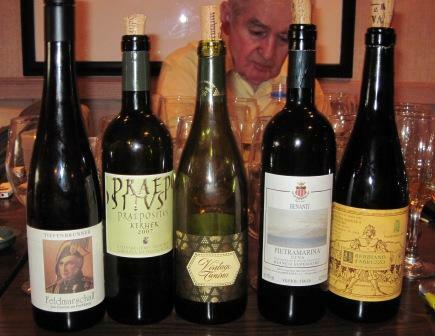 – so Ed McCarthy could challenge us with a blind tasting of his selection of Italy’s five best white wines. Those who know Ed’s and his wife Mary Ewing Mulligan’s books know that Ed has a massive store of information about wine. Those who know Ed also know that he has a pretty good fund of opinions based on it, so this was a fun lunch – despite the absence of pizza! – and an interesting tasting, as well as a substantial challenge. Abbazia di Novacella’s Kerner – a hybrid of Riesling and a lesser variety that does reasonably well in Germany and spectacularly in one of Italy’s northernmost vineyards, in Alto Adige. Jermann’s Vintage Tunina – a blend of several white varieties, including indigenous Tocai (now Friulano) and Picolit, from Friuli. Tiefenbrunner’s Feldmarschall – Müller Thurgau from high-altitude vineyards in Alto Adige. 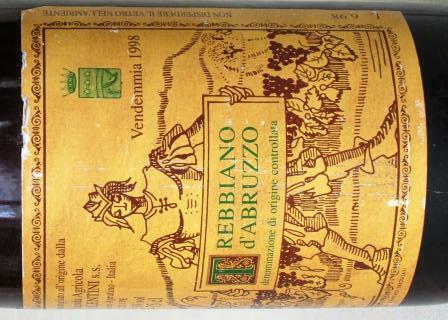 Valentini’s Trebbiano – a highly selected vinification from meticulously tended vineyards in Abruzzo. Though they are quite diverse, both geographically and stylistically, all – and this tells you a lot about Ed’s taste – are whites that are all the better for a few years of aging. I can think of a few wines I’d like to add to his list, but I’m interested in what others may think of Ed’s selections and omissions. Please comment, if you feel so moved.